information on the Tourism in Neemrana , Neemrana Travel, Hotels in Neemrana, Neemrana Hotels, Neemrana TOur Packages, Neemrana Tourism, Visit Neemrana, holiday offers for Neemrana, how to reach Neemrana and hotel booking for Neemrana. Neemrana town in Alwar, Rajasthan is quite ancient and is located on the Delhi-Jaipur highway. This magnificent town is located in the Alwar district of Rajasthan and commands scenic vistas of its rugged surroundings. Neemrana has got its name from a valiant local chieftain named Nimola Meo. He had to suffer defeat at the hands of the Chauhans and appealed that his name should be given to his lost kingdom. Neemrana is an ideal base to explore the surrounding destinations that have lots in store to offer to visitors. A trip to Neemrana is incomplete without a visit to the Neemrana Fort, which is the most popular among the tourist attractions in Neemrana. Neemrana Fort is located on a high hillock and it commands magnificent views of the surrounding beauty. Nowadays, the Neemrana fort is a leading heritage resort and is an ideal venue for weddings and conferences. When you step inside this hotel, you will virtually get transported to an entirely different world. The ambiance is simply captivating and features period furniture, antique works of art and frescoed paintings. The nearby town of Kesroli is located at a distance of 155 kms from Delhi and is an ideal base for exploring the grandeur and natural beauty of Rajasthan. This place is only some distance from Neemrana and excursions from Neemrana would be ideal for exploring this magnificent town that has also its mention in the mythology. According to the historians this place can be traced to Matsya Janapada of the Mahabharata times. Here you will come across some of the oldest remains of a Buddhist Vihara where the Pandavas are believed to have spent the last year of their exile. One can catch a glimpse of the reclining statue of Hanuman; memorial of the ruler saint Bhartrihari and Talavriksha with very old water reservoirs. As for the lodging, you can put up in the Neemrana Fort Palace or Hill Fort Resort that provide excellent accommodation options to the tourists. While staying in these hotels you can expect the utmost in terms of traditional hospitality and impressive services. The most modern range of facilities is extended to the guests thus making their stay an exclusive one. Neemrana is well-connected by air, rail and road transport. The nearest airport is New Delhi from where you can get flights for the other destinations of India and abroad easily. The rail and road transport from Delhi is equally good and you can avail any of two transport systems in order to reach here. 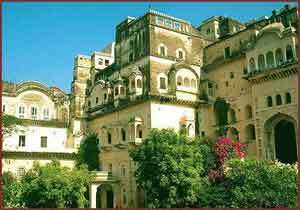 Know more about Neemrana by clicking on to the site touristplacesinindia.com, which offers valuable travel information on Neemrana.